Bank lobbying can distort regulatory decisions by introducing private incentives into the decision-making process. Regulators are criticised for serving both their own interests, and those of the banks they regulate, at the expense of the general public (McCarty et al. 2013, Admati and Hellwig 2014). This rent-seeking may make the resolution of bank failures less efficient, and society bears the cost. But lobbying can also improve the resolution process by providing decision-makers with important information. When a bank is failing resolution process is characterised by informational asymmetries, and so information about the best way to deal with a particular case is valuable for regulators, as is insight into the skills and motives of potential acquirers. This may improve the efficiency of the resolution process. It is difficult to distinguish between the two faces of lobbying (Facchini et al. 2011, Igan and Mishra 2014, Lambert 2018). In a recent paper, we attempt to do this using the sale of failed banks by the FDIC as a laboratory (Igan et al. 2017). The FDIC routinely auctions failed banks to interested bidders. Between 2007 and 2014, the FDIC auctioned 471 banks (including Washington Mutual) with a combined total balance sheet size of about $636 billion, or 5% of the size of the FDIC-insured banks as of 2010. If lobbying improves the resolution process, this should result in ownership being transferred to the best equipped bidders, who are most suited to incorporate the new entity and have the highest valuation for it. At the same time, the sales should result in low resolution costs, as stipulated by the least-cost test. This requires the FDIC to seek solutions that minimise the burden on the Deposit Insurance Fund (DIF). Our analysis is based on detailed information on failed-bank auctions during this seven-year period. 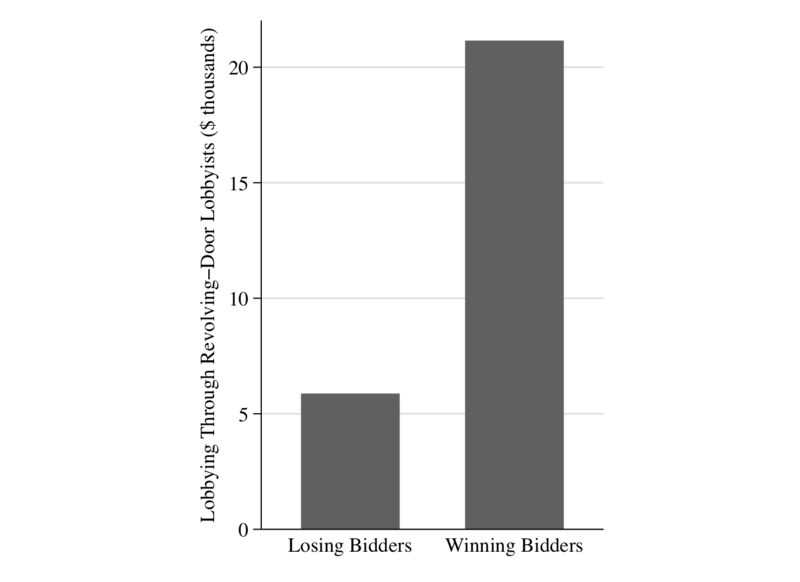 We first observe that the banks that win an auction spend much more on lobbying than losing banks (Figure 1). 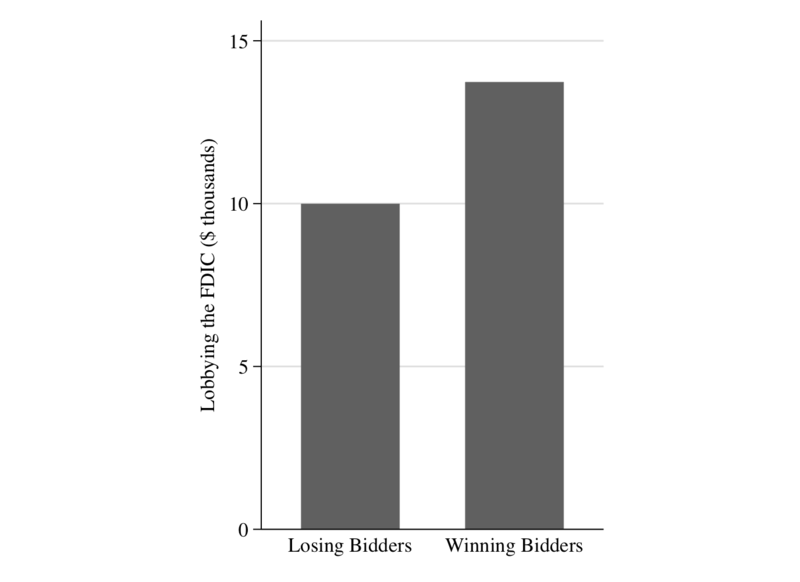 Lobbying increases a bidder's probability of winning an auction by 26.4 percentage points. Source: Igan et al. (2017). We compare actual resolution costs to the costs that the FDIC would have incurred if another bid had been chosen. Conditional on observable characteristics of the sale (including size and number of bidders), the cost to the DIF on account of lobbying is 16.4% of the total resolution losses. This is equivalent to a transfer from the DIF to lobbying bidders of $7.4 billion. Matching a failed bank to the right acquirer should result in the new entity being incorporated swiftly, improving its operating performance. Overall we find that acquisitions improve their return on assets and cost-to-asset ratio. But lobbying acquirers improve these measures of efficiency less that their non-lobbying counterparts. We also find that the market responds negatively to acquisitions made by lobbying banks, which is consistent with lower efficiency. The cumulative abnormal returns (CAR) around acquisition announcements decline by 0.9 percentage points, relative to the sample average acquirer CAR of 2.1%. Lobbying banks who underperform other acquirers are inconsistent with the efficiency-improving view of lobbying. Instead, our results broadly support the rent-seeking explanation of lobbying. In particular, lobbying allows banks to acquire other banks at lower prices. This suggests economic misallocation, because it may prevent the bank with the highest valuation from winning the auction. Even shareholders of a lobbying bank do not necessarily benefit from its lobbying activities. Lobbying banks obtain failed banks at lower prices, but at the same time this results in worse operating performance post-acquisition. This suggests that lobbying may be the result of agency problems (Shleifer and Vishny 1994). Managers try to extract private benefits from lobbying, because this helps them to grow their firm more quickly ('empire-building'), and become more entrenched. Lobbying banks are much more acquisitive in our sample, which supports this interpretation. In this view, lobbying has a double cost: it distorts the efficient allocation of failed banks (a social cost) and amplifies agency problems at acquiring banks (a firm-level cost). Our results suggest that bank lobbying affects the resolution process negatively, by exploiting the discretion regulators enjoy. This does not imply that regulatory discretion is undesirable – the ability to incorporate private information and to react quickly to new circumstances during the resolution process has important benefits for financial stability. But the resolution process should be designed to mitigate these costs by ensuring proper checks and balances. This includes establishing strong accountability mechanisms and a high level of transparency (IMF and World Bank 2009, Claessens and Kodres 2014). In this context, our findings are relevant for the US – where a framework for resolution of smaller banks is relatively well established, and the equivalent framework for resolution of systemically important financial institutions has recently been reformed – but also for jurisdictions such as the EU in which new comprehensive resolution frameworks are being implemented (Philippon and Salord 2017). Admati, A and M Hellwig (2013), The Bankers’ New Clothes: What’s Wrong with Banking and What to Do About It, Princeton University Press. Claessens, S and L Kodres (2014), "The regulatory responses to the global financial crisis: Some uncomfortable questions", IMF working paper 14/46. Facchini, G, A M Mayda, and P Mishra (2011), "Do interest groups affect US immigration policy?" Journal of International Economics 85: 114–128. Igan, D and P Mishra (2014), "Wall Street, Capitol Hill, and K Street: Political influence and financial regulation", Journal of Law and Economics 57: 1063–1084. Igan, D, T Lambert, W Wagner, and Q Zhang (2017), "Winning Connections? Special Interests and the Sale of Failed Banks", IMF working paper 17/262. IMF and World Bank (2009), An Overview of the Legal, Institutional, and Regulatory Framework for Bank Insolvency, IMF. McCarty, N, K Poole, and H Rosenthal (2013), Political Bubbles. Financial Crises and the Failure of American Democracy, Princeton University Press. Lambert, T (2018), "Lobbying on regulatory enforcement actions: Evidence from U.S. commercial and savings banks", Management Science, forthcoming. Philippon, T and A Salord (2017), "New ICMB/CEPR Report: Bail-ins and Bank Resolution in Europe", VoxEU.org, 22 March. Shleifer, A and R Vishny (1994), "Politicians and firms", Quarterly Journal of Economics 109: 995–1025.